To a greater or lesser extent, the destruction of the past is an on-going, universal project. Whether it’s demolishing old buildings to make space for new ones or cutting down woodland to accommodate agriculture on an industrial scale, we can’t ever really let things be. If we never destroyed anything, the world would be an even more weird, uncomfortable and overcrowded place but nonetheless there’s often more to our reluctance to let things go than simple nostalgia. In the last half century or thereabouts, China has witnessed wholesale destruction of its history in the name of both ideology – the Cultural Revolution – and, more recently, progress, as the past is razed to make room for the future. Nonetheless, Ai Weiwei’s destruction of ancient ceramics in the name of art might seem in some respects excessive. 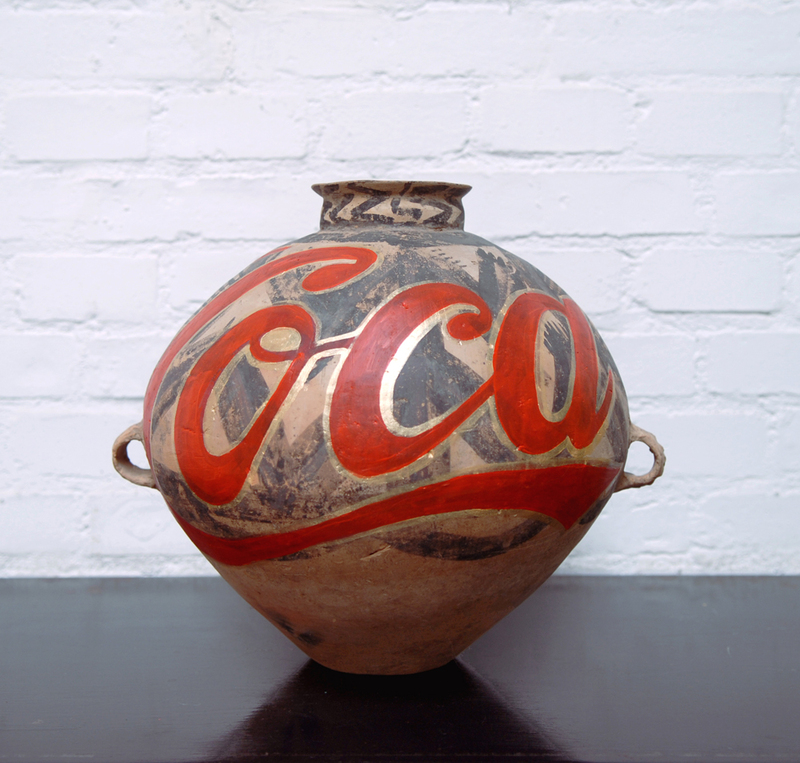 It certainly has the power to shock though perhaps one of the most surprising aspects is that the value of what one might assume to be priceless ancient artefacts such as a Neolithic urn dating from 5000-3000BC can be increased by the addition of a Coca-Cola logo. In using ancient artefacts as readymades or as materials with which to make art, Ai’s work clearly fits into a Modernist tradition but one which has never lost the power to shock as the furore surrounding the Chapman Brothers Insult to Injury – a set of etchings of Goya’s Disasters of War with the faces reworked to become clowns and puppies – attests. When that work was first shown (at Modern Art Oxford in 2003, so nearly a decade after Ai’s dropped urn) even the positive reviews used words like vandalism and defaced. There are obvious parallels between Ai’s work and that of the Champans – not least in the use of the Coca-Cola logo by both – but for me a more interesting comparison is perhaps Robert Rauschenberg’s Erased de Kooning (1953) though that act of iconoclasm was made with de Kooning’s permission. At the V&A, a small but fascinating display of Ai’s ceramic works – Ai Weiwei: Dropping the Urn – includes ceramics similar to ones dropped, painted or otherwise destroyed/altered by Ai as well as works by him that reference ancient Chinese ceramics. The display is tucked away in the furthest reaches of the V&A; a queue at the information desk and poor (well, non-existent, really) signage, meant I had to look the room number up on my phone – 146, for those who might want to visit it – then check the map to find the display. For reasons best know to themselves, despite its accompanying catalogue, the powers that be at the V&A seem to have decided to play this display down, possibly thinking an audience that comes specifically to see it might be disappointed by its small scale or museum display feel. Though on the whole I would rather see Ai’s work in a gallery context, there’s quite a lot to think about here as well as some beautiful works (the vases painted with traditional motifs but on the inside particularly charmed me). There is also a small patch of ceramic sunflower seeds similar to those that carpeted the Turbine Hall of Tate Modern in 2010-11 (which I’ve written about before). Here, occupying a small corner of the room, the seeds exert far less power though their relevance in the context of Ai’s ceramic works is undeniable. This entry was posted in Photography, Politics, Sculpture and tagged Ai Weiwei, art, ceramics, photography, political art, V&A by Ann Jones. Bookmark the permalink.